For the serious and successful Expert Author who wants even more highly-qualified traffic back to their website or blog, EzineArticles' Premium benefits package gives you significantly higher speed, confidence, control, convenience, freedom, and intelligence than you've already come to expect from our free membership, thereby increasing your overall article marketing success ... and your bottom line. Amplify the value of your marketing efforts with scheduled article release, 30 keywords used to find your articles, and 9 additional Resource Boxes to fine-tune your actionable message. Need more visitors? Increase traffic back to your website or blog with faster article review speed, speedy support, monthly summaries, and up to 30 keywords to target search engine users. Put the "author" in "authority" by getting the exposure you deserve with senior article review, VIP support, scheduled article release, and additional Resource Boxes for each of your personas. Build your credibility as a leading authority by amplifying your brand with senior article review and gain access to up to 30 keywords to discover how your audience interacts with you. The EzineArticles' Premium benefits package is designed to increase the effectiveness of your article writing and marketing efforts. Want even more highly-qualified traffic back to your website or blog? Need data to target new readers and build lasting relationships? Want greater control over your efforts and your brand? Gain speed, confidence, control, convenience, freedom, and intelligence to improve your overall article marketing success and increase your bottom line. Become a leading authority. Take advantage of each benefit the Premium package provides. Your articles go to the front of our editorial queues to be reviewed before all non-Premium members (that's before all Basic, Basic Plus, Platinum, AND Diamond members). Typical article review occurs within the same business day you've submitted your article. Having expedited article review will increase your article performance by helping you get ahead of your competition for timely published articles as well as begin working for you days (or even weeks) earlier than without this benefit. The longer your article is live, the more exposure and traffic you'll receive! When you have a question, concern, or would just like to run something by our Support team, the priority member support Premium benefit gives faster response turn around than non-Premium members (even faster than our elite Diamond level members)! Asking a lot of questions (and having those questions answered quickly) can help you prevent traffic-reducing errors and oversights as well as help you write more articles in less time. In turn, your articles will begin driving pre-qualified traffic and increasing your credibility faster than without Premium. Gain greater control to target your audience with a call-to-action that's ideally suited to the content of each article. Have more than one persona on your account? That's 12 Resource Boxes for each persona or pen name on your account. Using these Resource Boxes effectively will greatly increase your click rate, transparency with your readers, and branding power. Non-Premium EzineArticles members only receive the top 5 keywords readers used to find their articles. With this Premium benefit, you will get up to 30! This added intelligence allows you to simply integrate rich keywords into your article titles and Resource Boxes to increase your search power. Your keywords will continue to be refined and automatically updated for easy implementation to help you write reader-targeted articles that achieve a competitive edge in your niche. Carefully scheduling the release of your articles is not only more convenient, it can make a huge difference in your readership. With this benefit, you'll be able to publish your articles when you know they'll be most effective. Scheduling your articles means you don't "dump" them on your most loyal readers, which could potentially reduce the traffic you receive from them. The Premium scheduling benefit also allows you to target your article release to the best time for your niche, which means greater exposure for you as your audience will be more likely to read your article (great for international audiences!). This Premium benefit gives you access to metrics to help you strengthen your efforts and grow. Including comparative data from views to click rates to ezine publishers and more, this monthly data helps you determine which article topics bring you the highest level of success in order to write more success-driven articles. Alternately, you'll also discover what didn't work. This two-part process will help you refine your topic selection over time and aid you in discovering your perfect niche. Get this comprehensive data to capitalize on your most successful articles. You can't get all of these benefits with the EzineArticles free membership or anywhere else! Increase your bottom line. There are four different subscription periods: monthly, quarterly, semiannual, and annual. Are there discounts for longer subscription periods? Yes. The longer your subscription, the greater your discount will be. An annual subscription will provide you the most value. For example, a monthly subscription is a flat rate whereas a quarterly subscription will save you 30%, a semiannual subscription will save you 35%, and an annual subscription will save you 40%! Your credit card will be charged immediately for the entire amount of the subscription length you've chosen. As a service to you, we will automatically renew your subscription at the end of that period and your credit card will be charged. This automatic renewal process will continue until you choose to discontinue your subscription. Simply select the subscription period you'd like and click the "Add to Cart" button. When you're finished, click on the "Check Out" button. Will I get preferential treatment on article approvals and membership upgrades? Essentially, Premium subscribership offers no Editorial favor. Being a Premium subscriber does not guarantee that your article submissions will be accepted. All article submissions must still meet our quality measures as designated in the posted Editorial Guidelines (the same as non-premium members). 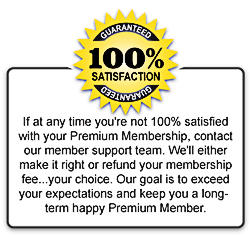 Being a Premium subscriber will also not impact or help your account level upgrades. If you take advantage of the Premium Support response by asking as many questions as you need to discover how you can improve your article quality, then this should not be an issue. You may be able to receive a 100% tax-deduction because EzineArticles Premium is a business service. Be sure to check with your accountant or tax advisor. Yes! If at any time you're not 100% satisfied with your Premium subscription, just contact our Support team. We'll either find a solution to make it right or refund your subscription fee - it's entirely your choice. Our goal is to exceed your expectations and keep you as a long-term Premium subscriber to help you increase your bottom line. PS: Because the EzineArticles Premium service is a business service, you should be able to receive a 100% tax-deduction. Be sure to check with your accountant.